(Left) Artist's impression of the hitching post, c. 1944, by Liz from Mad Bush Farm. This is the story of the journey through time of a piece of wood which at some point was transformed into a hitching post. Hitching posts and rails were a common sight in an Auckland where horse transport dominated the roads. This particular hitching post ended up situated on Parnell Road. If Marnie Spicer's childhood recollections (see below) are correct, the post probably dates from at least the late 1870s, if not before. It remains on the footpath directly opposite Cathedral Place; behind it, at one time, was the vicarage for St Mary's church. It seems that this humble hitching post has long survived the vicarage at least, the latter well gone by the time the post was noticed in 1944. The chief librarian at Auckland City Library, John Barr, started things off toward recognition for the post's heritage associations with a letter to the City's Acting Town Clerk dated 4 April 1944. "An old hitching post stands on Parnell Road near St Mary's Pro-Cathedral. As this relic of the past should be preserved, and if possible retained in its present location, I suggest that the City Engineer be requested to report on the best means of insuring that the post will be retained in its present position, and not interfered with should road works of any kind be undertaken in its vicinity. I would further suggest that a description of the use of the post should be attached to it or placed nearby." "to co-operate with [Council staff] in having an inscription attached to, or placed on, this hitching post, so that it would be preserved as relic of the pre-motor car days." A suggested text for the interpretive plaque was submitted to Barr for checking, and he wrote back to the City Engineer on 19 July 1944 with a change of wording. On 25 August 1944, Parker & Payne, an Albert Street engraving firm, submitted their estimate of £10 (later reduced on actual quote to £8 5/-). The City Engineer had the site measured up that month, and worked out specifications for the total project. 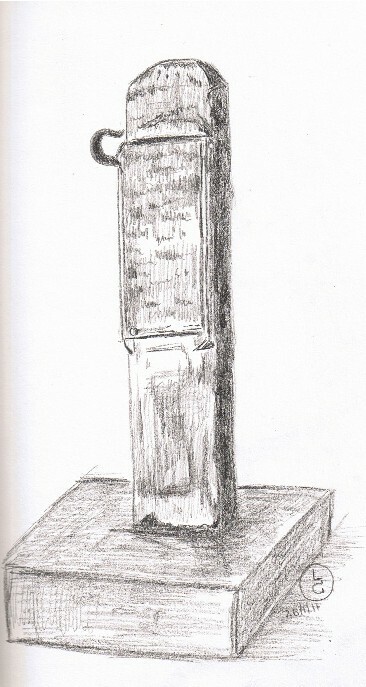 The post, 6" square, needed to be lifted up from the ground, have rotted portons removed (so that it measured, in 1944, 46" high), then seated in a concrete block 12" high and measuring 18" by 18". A creosote coating was to be applied to the timbers as protective preservative. The total cost of the work, as at 6 October 1944, was given as being £14 -- a project worth $1,100 in today's terms. On the same day, under their "Local and General" column, the NZ Herald announced to Auckland that the Auckland City Council had made the decision the night before to preserve the old post, and mark it with an "inscribed bronze plate." This report sparked off two reactions. The first came from E Bowden, District Officer for the Department of Industries and Commerce, Tourist and Publicity, drawing the attention of the Auckland City Council to the (wartime) regulations then in effect -- that the Council could not have a bronze tablet made for the post without the prior consent of the Factory Controller, a Mr G A Pascoe. Now there's something I didn't know about until this, but I'm not surprised given the era. This business about Factory Controllers stemmed from the very start of the Second World War, amid the perceived need for regulations controlling the supply of materials. The Minister of Supply, the Hon. D. G. Sullivan, states that the Factory Emergency Regulations are an essential part of the Supply Control Emergency Regulations and that they provide for the regulation and control of factory production in those instances where such action is necessary in the public interest during a period of war. "Manufacturers will be only too well aware of the many difficulties which may arise not only in supplying many essential requirements for defence purposes but also in providing the needs of the civil population without interruption and in maintaining continuity of employment," said the Minister. "... Under certain conditions which might develop it would be necessary in the public interest for some classes of materials to be conserved to the utmost degree, with the additional possibility of devising the use of alternative materials or substitutes from domestic sources." The City Council went ahead and applied for permission from the Factory Controller for the hitching post plaque, and received approval by 24 October 1944. Then, Marnie Spicer wrote a letter to Auckland City Councillor Joan Rattray, 14 December 1944. I saw in the Herald one morning lately that the City Council intend to preserve the "hitching post" in Parnell Road near the gate of what used to be St Mary's Vicarage. As a child I used to visit there with my mother, and have often seen the late Dr. Maunsell (the Vicar) tie his horse up to that particular post. He was a great favourite with young and old parishioners, and we loved his Irish tongue. It would be nice if the plate had his name inscribed as he was one of the early missionaries sent out from England by the C M Society. Marnie Spicer was the daughter of Archibald Hitchins Spicer, who had for a time lived in Avondale in the early 1860s. Marnie herself wasn't born until 1872, a time when Robert Maunsell was Archdeacon of Auckland. This dates her memories as anywhere from 1875 to 1883, when Maunsell retired, although he still kept contact with the Parnell district for years after that. Ah, but the story of the Parnell post does not end there. In January 1949, it had apparently taken quite a hit, perhaps in a motor accident. The Town Clerk advised the City Engineer on 19 January that the post had been damaged, the foundations loosened. The City Engineer reported two days later that instructions had been issued for the post's repair. Then on 19 August 1952, the post vanished entirely. A relic of the horse and buggy era, one of Auckland's few remaining hitching rails, that in Parnell Road, has disappeared. The whereabouts were unknown last night. Affixed to the footpath near an empty section where once stood the house in which the novelist Hugh Walpole was born, the rail was discovered on Tuesday to have either fallen down or been knocked down. The day following the Herald report, the post was reported found -- at the Council works depot. After the post had been knocked out of position early this week an Auckland City Council foreman too it to the depot. There the base is being cleaned. It is not badly rotted and is expected to remain for a long time as a reminder of Auckland's horse and buggy days. The post was reinstalled later that same day. The post continued to remain despite the dangers of Auckland's increasing motor traffic -- but it couldn't withstand the effects of time and the weather. Rot set in, despite the wartime creosoting, and in March 1966 the secretary of the Auckland Regional Committee of the NZ Historic Places Trust wrote to the Town Clerk advising that the top of the post had cracked, and the post itself was opening up, with evident signs of rot. On 25 March 1966 A J Dickson, the Director of Works and City Engineer at the time, replied that the post would be capped to correct the deterioration. And so the post went through another transformation, losing the metal hook on the side by which the good Rev Maunsell had secured his horse all that long, long time ago, so that the rotted part of the post could be removed, and a copper cap installed. The prominent base, at some point, was also lost. Today -- this is the last hitching post in Auckland. On 23 September 2010, the hitching post was scheduled as category A under the old Auckland City isthmus district plan, despite the fact that the rot, the oldest enemy of the post's continued existence, seems to be continuing unabated, and also the fact that it has been chopped about and great reduced in size over the years. Carolyn Cameron of Parnell Heritage who told me at the Auckland Research Centre last Friday that the hitching post was still there -- thus sparking off a Timespanner blog post hunt for the post and my scramble that afternoon to get on a Link bus to go photograph it. Liz Clark -- thanks, my friend, for helping this obsessive history buff with your art. The staff at Auckland Council Archives for retrieving the file on the hitching post. NZ Herald. The best image of the post as it was is from the issue of 23 August 1952, p. 10. Heh heh heh you're welcome Lisa. That was a great conversation we had last night about the hitching post. Great post fascinating story. Glad I could help out! You're a treasure, Liz. Thanks for helping with this! Hey no worries at all you're welcome! Interesting indeed. Note it has since been moved and is now on the other side of the footpath away from the curb. A bit further along -- and the brass plaque has been nicked, so I hear.